Of course, its December 13th and I’m barely aware that the Christmas Season is quickly approaching. I have too much work to do for shopping. I say that every year but now that my children are young adults and the desire to make this time of year special for them, I find that I’ve lost all interest in the commercialism of the Season. There is one thing I am excited about! I’m finally getting old enough to really appreciate the opportunity to focus on the virgin birth and the blessing of the birth of Jesus, Our Christ! As I bow my head to pray daily, I find myself uttering ongoing thank you’s to The Father who decided to give us His ONLY Son that I might even have the right to speak His Name. 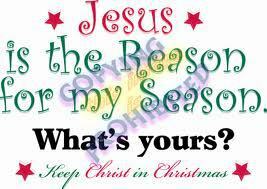 The gift of Jesus is the Only Real Reason to Give! Each opporunity to give to someone less fortunate or simply someone we love can only be an expression of the Blessed gift we were given 2000+ years ago. I praise God for allowing me to live long enough to understand His Purpose and His Vision for my life. I will only give to others to glorify Him, not myself for truly Jesus is the Only Reason to Give!